Summary: The trees and saguaros in Ironwood Forest National Monument appear to be in good to excellent health at all of the hundreds of sites we visited. We found at least a few seedlings and saplings at nearly every location. Many sites had more dead plants than young ones, which may indicate a decline in population size. But long-term, cyclical changes in species abundance is normal in deserts (Turner et al. 2003). We used size-age class distribution as a major indicator of health of tree and saguaro populations in 22 quantitative census plots. (Assessing the size-age classes of saguaros was straightforward, but correlating the size of trees with their age was difficult to impossible for the four common tree species.) The presence of a number of plants in each size-age category indicates a stable population. But the scarcity or absence of one or more classes at a site is not necessarily a sign of a problem. In desert climates successful recruitment into a population occurs only during occasional periods of mild temperatures and above-average rainfall (Dimmitt 2000b). 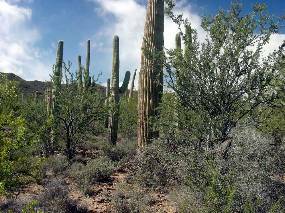 Saguaros in southern Arizona manage substantial establishment of seedlings only a few times per century (Steenbergh and Lowe 1983). There are no publications on the frequency of recruitment of the Sonoran Desert’s legume trees, but they are also uncommon events (Bowers 2001). 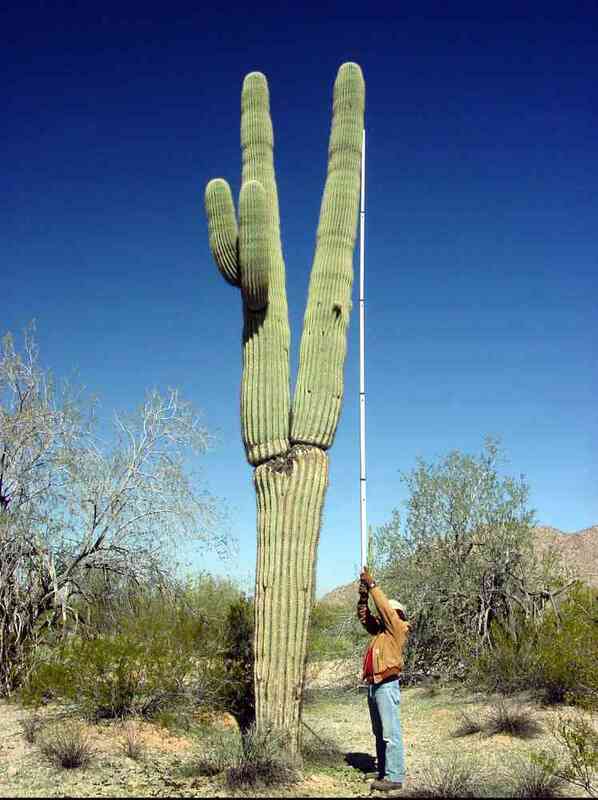 Saguaros are the easiest to evaluate. Of the 22 census plots all except one had a substantial percentage of plants in each of the size-age categories. 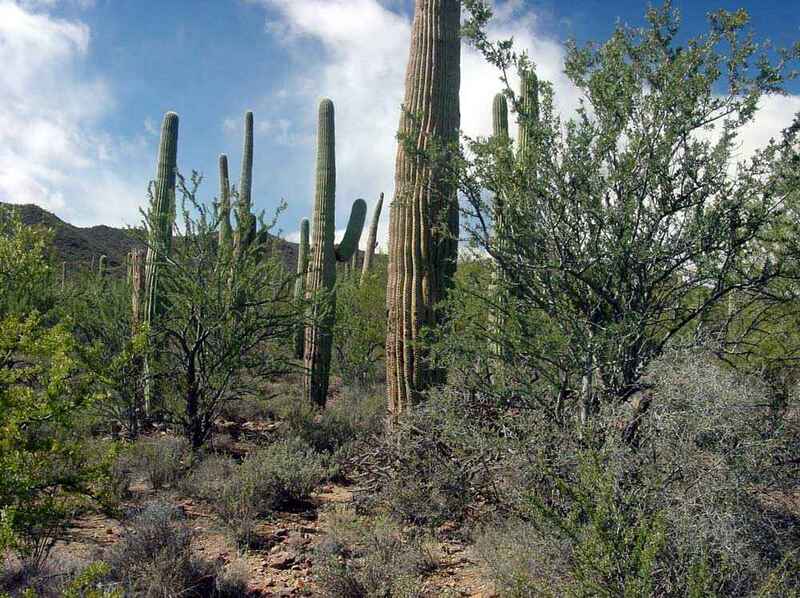 Saguaros were uncommon on a plot on the bajada of the Samaniego Hills, and all the living plants were mature or old individuals. 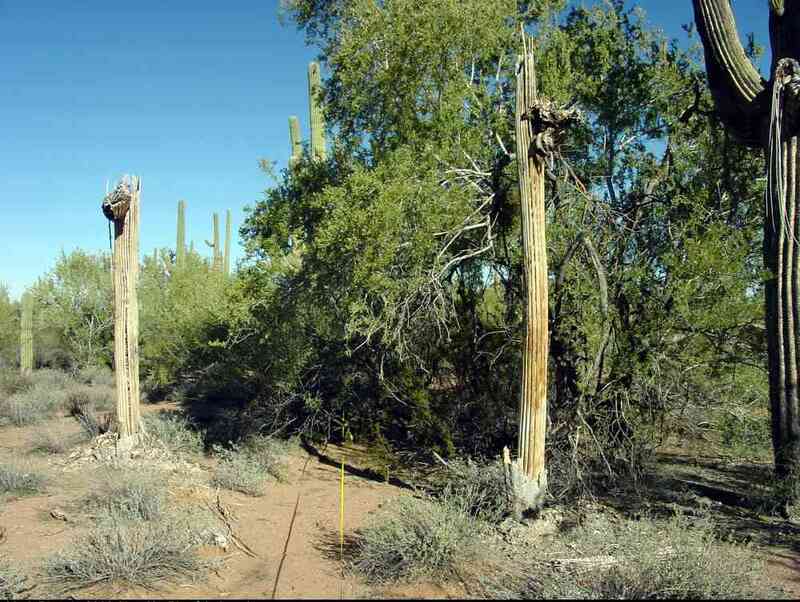 This plot also had the largest percentage of dead saguaros (29%). This site is on the edge of the cold Avra Valley in Lower Colorado River Valley habitat. Recruitment events are probably very rare here. There may also be a sampling error due to the small size of the census plot (4000 square meters). 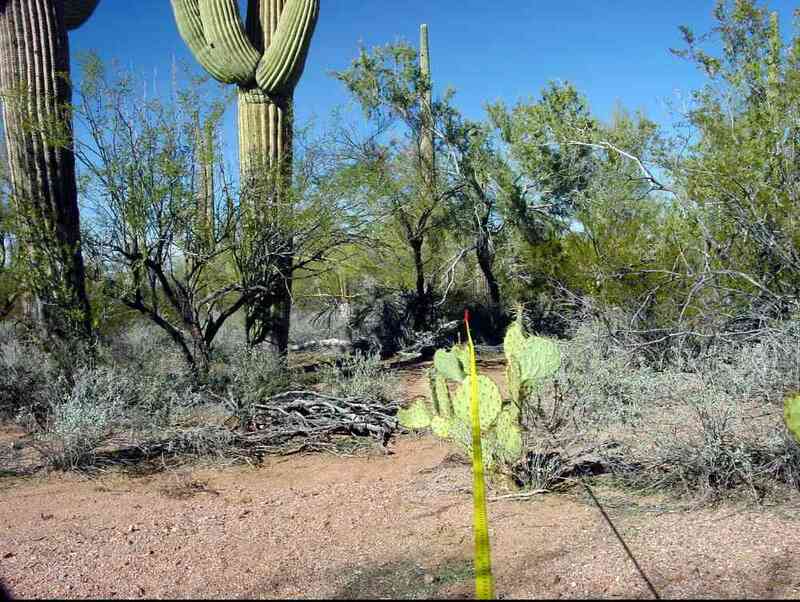 Photos reveal younger saguaros outside the census plot. 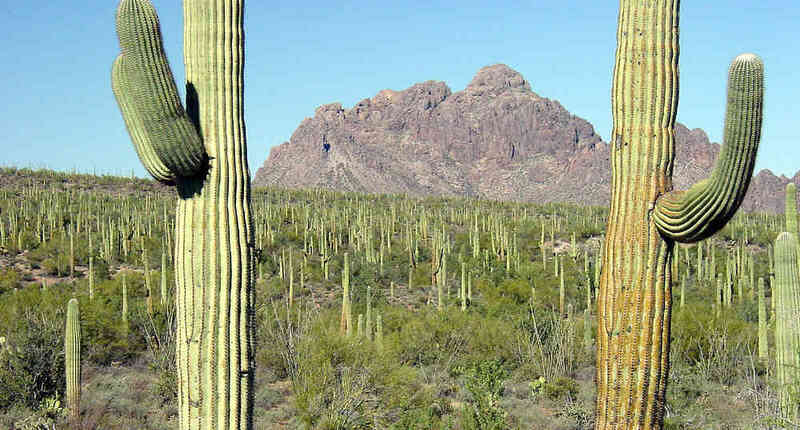 Saguaros are common in most of the Monument except on steep north slopes and valley floors. The densest populations are on bajadas, particularly on the south- and east-facing bajadas of the Roskruge, Sawtooth, and Silver Bell mountains. Densities in some places approach those in Saguaro National Park Tucson Mountains Unit which has the most luxuriant saguaro forests that we know of. 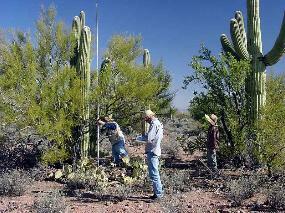 In six IFNM plots saguaro density exceeded 250 total plants per hectare (101 per acre). 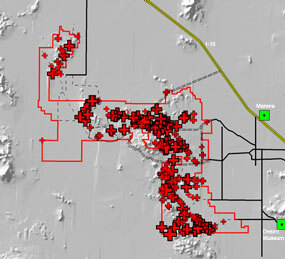 Saguaro distribution in IFNM. Sizes of symbols indicates relative abundance from rare to abundant. 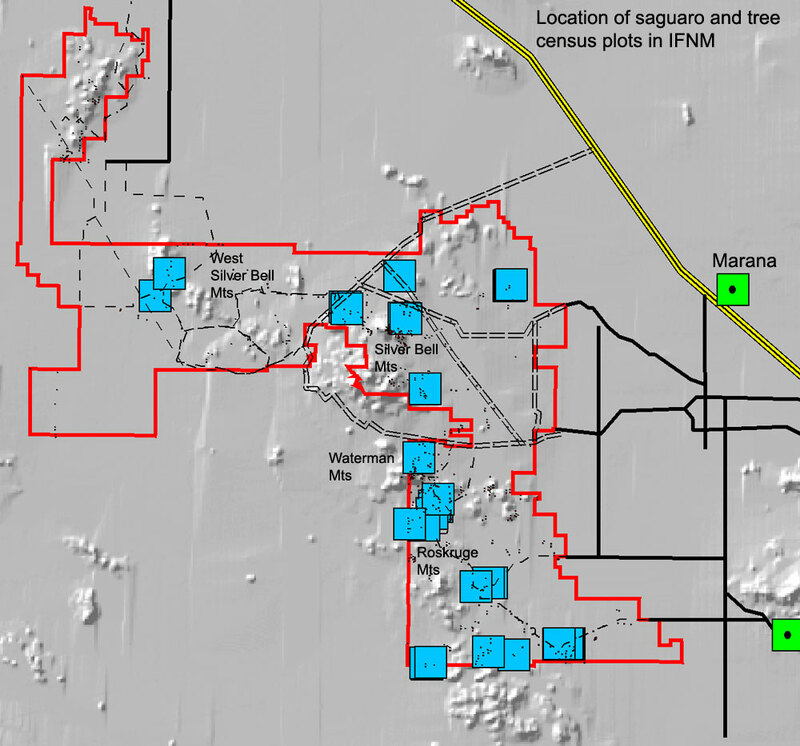 Saguaro distribution in the southeastern corner of IFNM. Sizes of symbols indicates relative abundance from rare to abundant. 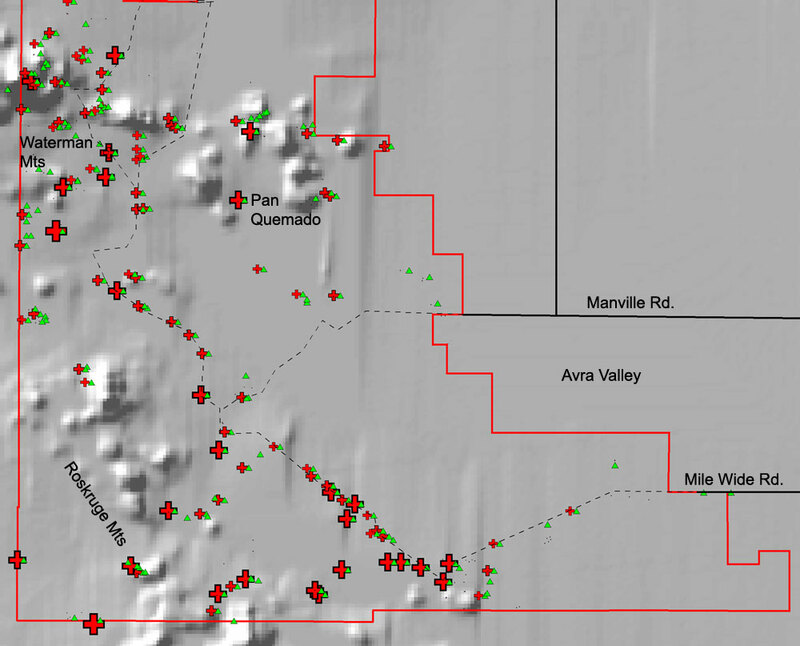 Green triangles indicate sites surveyed. 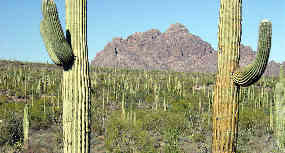 Saguaros tend to be common on bajadas and slopes of Arizona Upland except north-facing exposures. The valley floors are colder Lower Colorado Valley and have few saguaros. 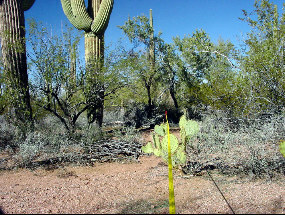 Ironwood tree populations are probably healthy, though it is difficult to assess their status from a one-time survey. Many specimens on bajadas and rocky slopes look poor by “normal” tree standards in that they often have more dead limbs and trunks than living biomass. This is normal for a species near its limit of environmental tolerance (its range extends only another 40 miles to the east). The growth habit of ironwoods near the limit of their cold tolerance is more similar to that of the highest-elevation bristlecone pines than to more typical temperate zone trees such as oaks and elms. 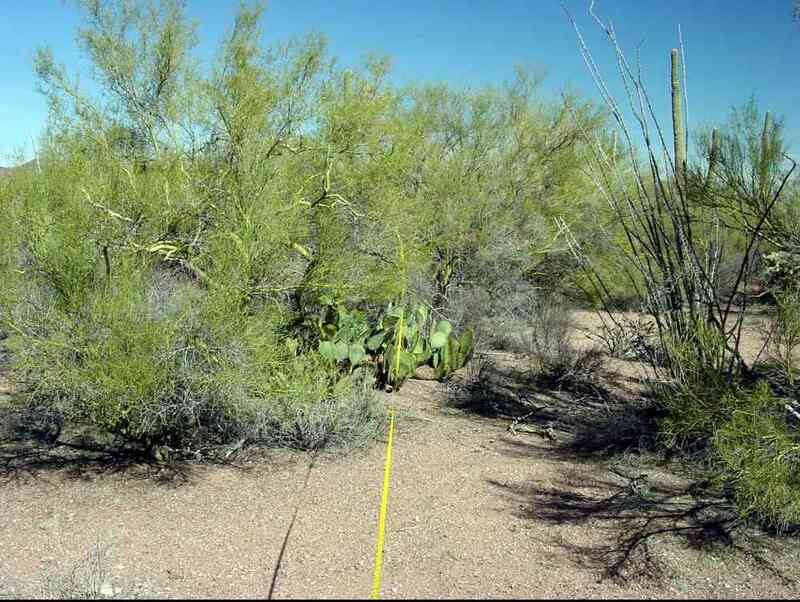 Most census plots had few small (presumably young, but read on) ironwood trees (less than 2 m, 6.6 ft tall). But in such a long-lived species recruitment is expected to be low, and recruitment events in deserts are widely-spaced. The high proportion of dead trees on some plots also indicates a problem at first glance. 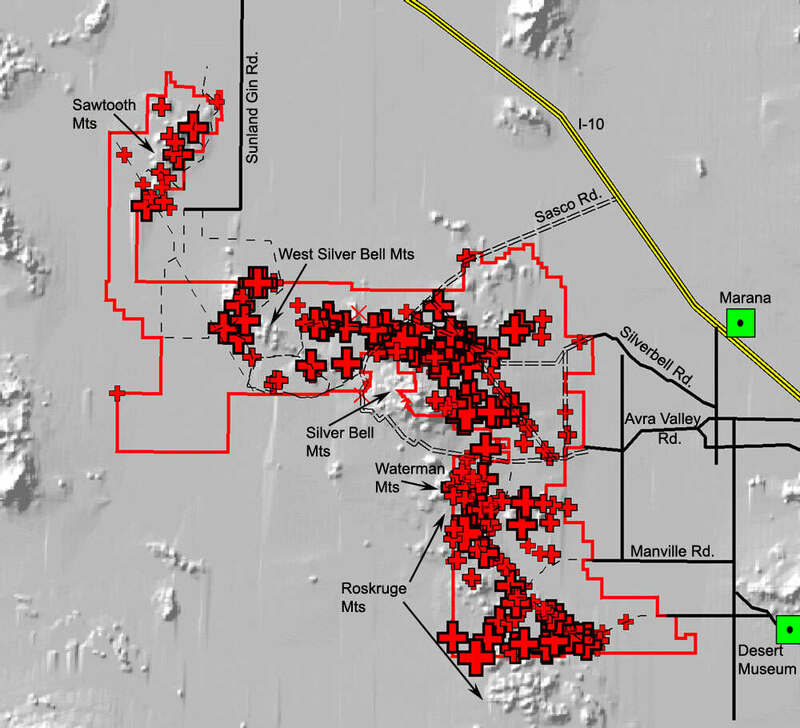 On five plots more than 20% of the ironwoods were dead; 40% and 48% were dead on two plots in the Waterman Mountains. The concern is virtually eliminated when one realizes that dead ironwoods take centuries to weather away (Dimmitt 2000a); a small remnant of heartwood was carbon-dated at 1600 years ago (Wes Ferguson, unpublished data). Most of the dead trees were ancient stumps. There were few with intact branches and twigs that indicated death within the last decade or two. Plot F28 is in fact one of the most beautiful groves of trees and saguaros we found (see images). On more than half the census plots at least 90% of the ironwoods were alive. Again considering the slow decay rate of dead trees, mortality must be very low at these sites. See the ironwood natural history section or the ironwood tree gallery for more detail on distribution, growth rates, and longevity. Ironwood trees occur at high densities in some rocky habitats where the thin soil restricts their size. Nearly half the plots had more than 100 ironwoods per hectare (41 per acre), with the highest being a remarkable 315 live trees per hectare (127 per acre) on a plot in the Roskruge Mountains (image at left). 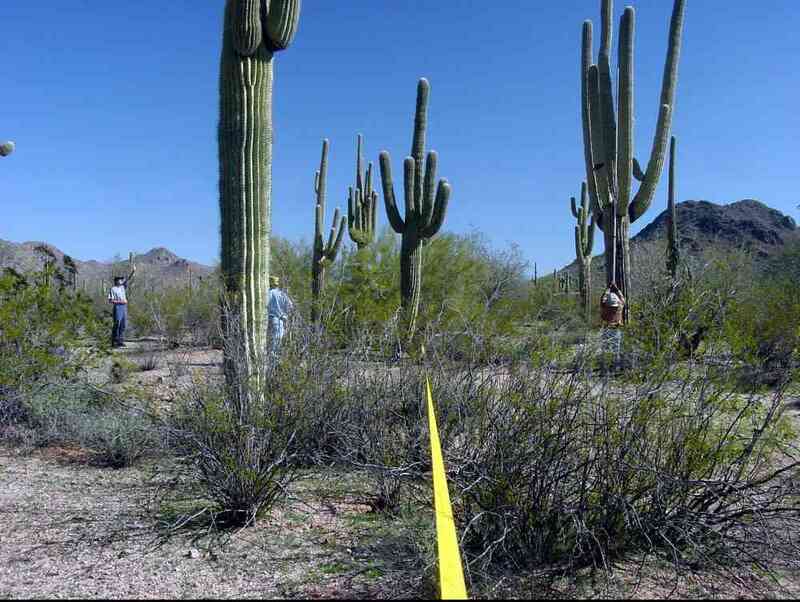 This plot also had 270 live foothill palo verdes and 165 saguaros per hectare (109 and 67 per acre, respectively). This location is more a shrubland than a forest, with both ironwoods and palo verdes averaging less than 3 meters (10 feet) in height. See the ironwood natural history section for more. 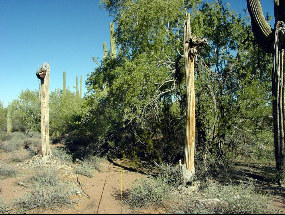 The foothill palo verde population is in general good health, though there was significant mortality from recent droughts. Palo verdes are apparently less drought tolerant than ironwoods. While 15% of ironwoods on all plots were dead, 18% of foothill palo verdes were dead. Palo verdes decay to weathered stumps in a couple of decades, so this slightly higher number of dead plants indicates a much higher mortality and population turnover rate for palo verdes than for ironwoods. Our observations are consistent with published information about this species (Bowers and Turner 2002). 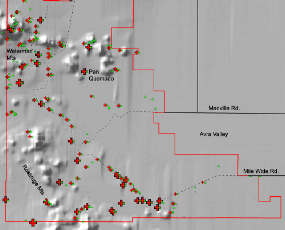 In 1999 20% of the foothill palo verdes on Tumamoc Hill in the Tucson Mountains were dead; many died during the drought of the late 1990s (Bowers and Turner 2001). If the current drought continues, more palo verdes trees will die in IFNM. This is not cause for great concern because such episodic diebacks are natural (Shreve 1924/1925). There were insufficient blue palo verdes on the census plots to analyze their health. They occur in many of the larger washes, and our observations indicate that they are doing well overall. Velvet mesquites were uncommon in most of the plots we selected. They are abundant in many of the valley floor washes, often occurring in nearly pure bosques of large trees. They are in excellent health. They may be even more drought resistant than ironwoods. Even though they were usually stunted shrubs on our bajada census plots, 100% were alive on 10 of the 13 plots on which they occurred.